My childhood home has a Meyer lemon tree growing in the backyard. It’s over 40 years old, and yet my dad is able to harvest hundreds of lemons from it every year — and share them with me. We love it! I lived a privileged life as a child in as much as I had this wealth of lemons twice a year. We weren’t rich. Ours was quite the modest neighborhood. But thanks to a backyard garden, we ate like kings. And fresh lemonade was a regular feature on our table. I never had a grocery store lemon until I went to college. And I was stunned. Meyer lemons are a totally different and beautiful experience when it comes to citrus. The Meyer lemon is a cross between a lemon and a mandarin orange. Frank Meyer, an USDA employee, collected a sample of the tree when he was traveling in China in the early 20th century. For most of that century it was relegated to backyard gardens, particularly California gardens like ours, because its thin skin wasn’t sturdy enough for mass distribution. In the late 1990s chef Alice Waters and home manager extraordinaire Martha Stewart helped the Meyer Lemon come into its own. And it continues to grow in popularity. Recently Stash Tea sent me a sample of their latest flavor — Meyer Lemon. Herbal tea takes me back to the year I lived in France and my friend Sarah and I explored all flavors of tisane. We would have loved this one, crafted from a blend of rosehips, lemongrass, orange peel, hibiscus, Meyer lemon oil, and safflower. Currently, Stash is running a recipe contest, featuring this newest flavor of herbal tea. There are several different categories to enter. 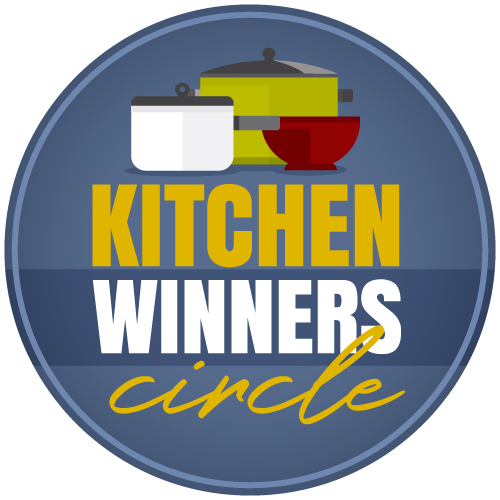 And the prizes include a Kitchenaid Mixer, a dutch oven from Le Creuset, a Breville blender, a Takeya tea maker, and of course, cases of Meyer Lemon Herbal Tea. To read more details on the contest and to enter, go here. I got creative with this tea and decided to use it in baking. I already had a bag of Mix and Match Muffins in the freezer. So, I substituted tea for the liquid. 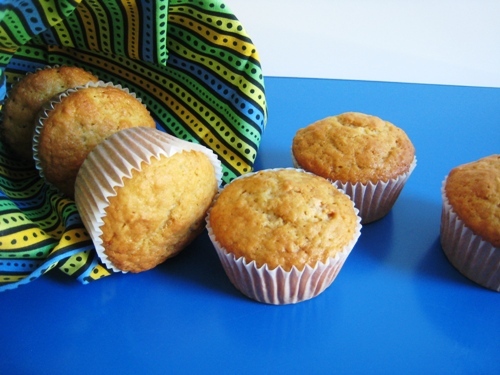 The result was a batch of lemony sweet muffins that my family devoured in a flash. 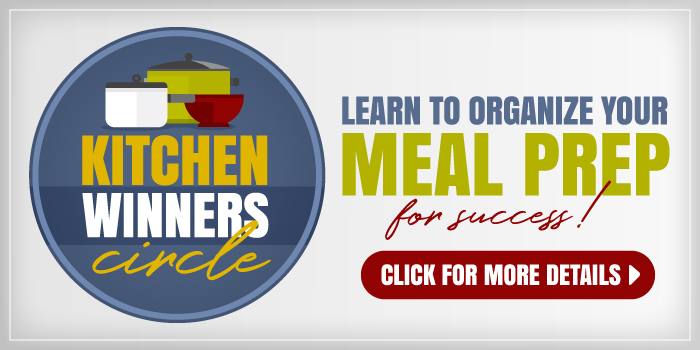 In a separate bowl, combine oil, milk, yogurt, and eggs. Whisk to blend. Add wet ingredients to dry. Fold gently until mostly moistened, but still lumpy. Fold in mix-ins. Divide batter amongst 24 muffin cups. Bake 25 – 30 minutes, or until a tester comes out with a few crumbs attached. This week Stash is offering a free box of Meyer Lemon Herbal Tea to three GoodCheapEaters. To Enter: Simply leave a comment on this post, telling us about how and when you serve tea. This giveaway will be open until Sunday, May 1st at 8 pm, PST. Winners will be chosen randomly and notified via email. You will have 48 hours to respond to the email in order to claim your prize. Over the last few months I’ve collaborated with a great group of bloggers in the Put Your House in Order series. Each of us has covered a different aspect of home management. 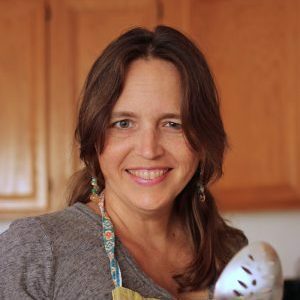 I’ve shared recipes and kitchen tips. Connie has posted tips on family management. Myra rocked it on the home decor. Alyssa has talked about budgetary issues. And Courtney has addressed topics of faith. Disclosure: I received tea samples from Stash Tea. I was not compensated to publish positive comments. All opinions are my own. IN the morning hot. Am trying to NOT drink coffee in the morning. In the afternoon Iced, and in the evening. Herbal hot! 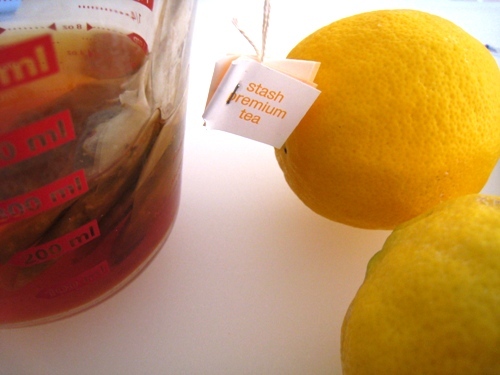 Would love to try the Meyer Lemon tea by STASH! I enjoy hot tea every day after lunch instead of dessert. I would love to try to Stash tea, especially the lemon tea. We drink a lot of tea around here. Black tea, iced and hot, are our especial favorites but we love almost anything black or herbal. We make a pot of hot tea every morning when we sit down to do homeschool. Thanks for the giveaway! I use tea to help combat math anxiety. As a math tutor, I work with older students returning to college. I’ve found the biggest problem with my students isn’t lack of skill, but lack of confidence. I keep a tea tray with all different kinds of teas on the ready, and it is amazing how a cup of tea can help them relax, focus and overcome mind numbing anxiety. It doesn’t seem to matter whether I’m working with algebra, geometry, trig or calculus…a nice cup of tea is a common denominator for success! As we live in the south, we drink iced tea every single day. 😉 But I also love herbal tea. I’m a singer, so I drink it whenever I feel a scratchy throat coming on, and serve it to my guys (they’ve gotten over the “it’s-not-masculine-to-drink-hot-tea” thing) when they are fighting a cold. Since we visited England we have made tea a daily ritual as a time to sit down and enjoy the moment whether with family or friends or alone. It is an enjoyable way to start the day, with meals and a respite during the day and a lovely way to end the day. We serve it everytime we have guests and my children love to select their favorite tea. We usually serve it hot but as the weather warms up we will add cold tea as our beverage of choice. we drink tea all the time, it is our drink of choice over coffee. My son is a huge earl grey fan but chamomile is a close second. We like to drink green chai tea, as a dessert on cool/cold days! I drink hot tea in the winter to warm up or when I have a cold and sometimes I add honey to it. In the summer I drink iced tea–usually unsweetened. I tend to drink decaf tea at night. Love a good herbal tea! I drink lots of tea – hot tea in the winter and iced tea in the summer. Love it! I serve my tea flavored and usually on ice. I usually serve tea on hoildays like mother’s day, girls day out and other special occassions. It is also nice to have when I am sick. My son has been in the hospital for 5 months. My daughter was so stressed the other night. I asked if she would like some tea. She said yes and seemed to really enjoy it! This tea sounds wonderful! I only drink water and tea, so I drink tea pretty much anytime – with meals, as a nightcap, if I’m dragging during the day. During the summer I love to make herbal sun tea and drink it all day. We drink tea as a pick-me-up when we need a bit of energy or when we have a minute to sit and relax, a cup of tea fills the bill. I am a tea fanatic. I drink a couple cups of tea every day. I recently had my mother-in-law come to visit and she wanted a cup of tea. She was astounded by the selection (but surprised I didn’t have any plain Lipton). I would love to try this Meyer’s lemon tea. 🙂 I’ve never thought to bake with tea, but what a great idea! I love peppermint tea with a touch of honey. Great to warm up in the winter! My husband loves a good glass of sweet ice tea! I serve tea when I host Womens Bible Studies in my home or when a friend stops by for a chat. It is so comforting! I drink tea every day, usually in the afternoon. One of my favorites is the Stash Green Chai tea, but I recently gave up caffeine, and am looking for herbal substitutes. About mid-morning I love to sit down with a hot cup of tea, put my feet up and read something inspirational. It sets the tone for the rest of the day. Well, I’ll have to admit that I’ll probably squirrel away the tea and hide it as Lemon is my favorite!! LOL No, I will probably share my tea and sit on my front porch swing and savor it ? Thanks for the giveaway. I love herbal tea since I don’t drink coffee or anything with caffeine. I like it in the mornings or on a cold day to warm up. I love it when I am sick with honey and lemon juice (usually fresh from my tree, I have a meyer tree too). I love to serve and drink tea anytime, But, one of my favorite ways to serve tea is as a night cap. I like to keep a pot of green ginger or rooibos tea on my desk at work to sip on all day. I add some local honey to my first cup in the morning to help combat my seasonal allergies. I would make iced tea out of this tea and serve it with a slice of Meyer lemon. I drink a lot of tea when I have a cold. Also, on a snowy day it is great. We drink hot tea or iced tea depending on: our mood, health, and occasion. We enjoy a variety of flavors and often share them with friends. Thanks for the opportunity to win! Blessings! I drink tea any time of day. 🙂 Mornings and evenings are a favorite, though! I drink tea with breakfast. And, I’m the weirdest person in the world – I like it at room temperature. I grew up drinking Earl Gray, so that’s currently my fave! I drink it at work… I work 3rd shift, so it could be night-time or in the morning! I enjoy tea all the time! I loved your idea of a snack time after school, so we try to have tea time every afternoon after we finish lessons. I don’t drink soda but I LOVE sweet tea! I drink it year-round, especially in the summer. I serve tea with meals, hot in the winter or cold in the summer. I also serve it when anyone in the house is sick. For me being a single mom with no family in the current city I live in, my retreat is my tea-treat. Whether early before my babes rise or in the eve when they lay I enjoy my cup of tea with a wedge of lemon a tsp of honey and a tsp of stevia at times some milk. But, I unwind and I recount my thoughts for the day. I use that time not only to reflect, but also to meditate and plan the next venture! I love bringing out tea when the fall season starts. I love chai tea and orange spice. The lemon sounds good too! earl grey with my sister! I drink hot tea every morning. I actually drink Stash’s chai tea every morning. I would love to try this new flavor. I drink iced tea year round and would love to try a new twist. Thanks for the opportunity! I drink hot tea when I have a moment to myself in the fall and winter. Since I’m from the southeast, we drink iced tea — “sweet tea” we call it — almost year-round with meals, but since I’ve been trying to drink more water I limit it to once a week now. This Meyer Lemon tea sounds delightfully yummy. I serve tea to myself all day long, but I enjoy getting out my teabox for others whenever we have company over for an evening (especially after a meal). We drink tea every day in the evening. Or definitely when we are sick. And this tea looks good! Any time of day, really. Especially on days where we’re feeling a little low or sore-throatish or we have my friend over who is a HUGE tea drinker! water and letting it steep for 3 minutes. The Meyer Lemon tea sounds great. Making tea is my little comfort ritual for rare and special “ME” time. I am very fussy about it, scalding the pot just so, choosing the particular teapot and cozy to match my mood or the season. I most like to brew up a nice pot of tea in the evening and settle down with it and a good book. I drink tea every afternoon and I also serve ice tea when we have company over. I love it! I drink tea all day long, mostly cold. I love all different types and flavors. On cool afternoons or evenings, or when we are feeling a bit rough I love to serve a hot mug of a fruity tea. Yes, a big mug of it so hands can be warmed too. My son and I have tea every afternoon while the two younger children are asleep. It is a great bonding time for us and allows us to reconnect after the day’s craziness. I like hot tea in the winter when it’s cold, my husband is a big fan of sweet tea (cold) all the time. We are a family of tea drinkers. We usually have an Irish Breakfast tea in the morning, iced green tea during the day and we always have a cup of hot herbal tea at night time. The new Meyer Lemon Herbal Tea sounds wonderful for the summer. I love the taste of Meyer Lemons, they are so sweet and fresh tasting. Year round! In the winter and fall it’s always served hot and in a variety of flavors both loose and bagged. In the summer and spring, black iced tea lightly sweetened! It’s always a lovely alternative to soda for a refreshing drink for guests. Love it! My mom and I like to have tea together in the afternoons or when I’m sick. Those muffins look great! I have a cup of tea most mornings around 6:00 a.m. during my quiet time and then often have a second cup in the afternoon right before I teach piano lessons. I love tea of all kinds, but especially black teas. We drink tea in the summertime with ice in it. i have friends that love a cozy cup of tea. when we get together it’s so nice to chat over a cup of tea. I like iced tea almost all the time. Hot tea is wonderful when I have a sore throat. So soothing. I’M A MORNING TEA DRINKER! 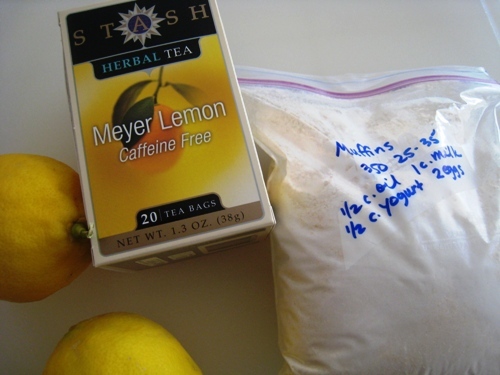 I too made the switch from coffee to tea in the morning- I am wondering how that meyer lemon tea would taste as iced tea….. yum! How and when do I serve tea? All the time! I start my day out with black tea and usually have a cup of something after work. Sometimes there’s tea after dinner as well. It’s possible I’m a little obsessed. In the morning, I make myself a cup of hot tea to drink while I have my quiet time. Afternoon Tea Time with my little girls is another great time for tea. And sometimes before bed, I unwind with a cup of tea. I enjoy tea in the afternoons. Lately I’ve been drinking Lady Grey tea. In the evenings before bed, with a good book. I love tea at nighttime, when I am done for the day and am ready to just sit back and read a good book. My favorites are the fruity ones: raspberry, peach, and lemon. I’m a big tea drinker…I have a cup everyday, usually in the afternoon. I love that you used it in baking. When don’t I serve tea? I drink it all day long! Ooh…. 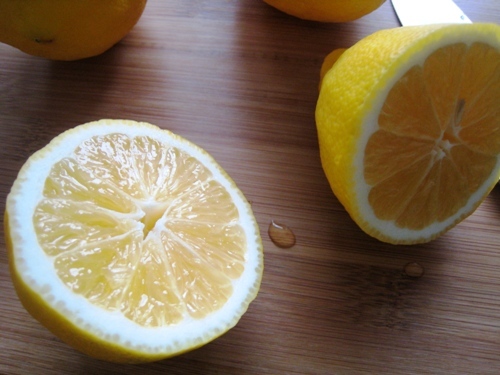 meyer lemon is one of my favorite fruits in the world! I am going to have to try this tea!! I love English breakfast tea with a splash of milk and plenty of sugar in the morning… iced tea with lunch or dinner or in the afternoon… and occasionally a rich, spicy decaf chai in the evening for a yummy, relaxing treat. Tea is a comfort food, what I or the kids have at the end of the day to help us wind down. I drink hot tea in the morning and evening and iced tea during the day. I serve black/regular tea with lots of sugar ;). So, I’m from the south and of course we drink our tea SWEET! However, I’ve been branching out the last few years. I love to drink unsweet tea with lots of LEMON, hot peppermint tea, hot green tea, and really enjoy fruit flavored cold teas! Mmmm hot cup of tea in the morning to kick off my day. Honey & tea for sore throats. Sweet tea chilled for a treat in the afternoon. Okay I love it anytime of day! Whenever I am in the mood for a cup. I like to have a nice hot cup of tea around 2 or 3 pm. It is the perfect mid afternoon break! I actually have yet to try meyer lemons, I don’t usually see them so I just get regular. I drink Tea every morning though, I love it! I serve tea every Wednesday night when I have a couple mom friends over after the kids are all in bed. I’m not a coffee drinker, so I drink tea anytime during the day! Most days I have one mid-morning, mid-afternoon, and before I go to bed. I like hot tea in the morning. I like to have herbal tea in the evenings while watching TV. I also like to drink green tea while I’m at work. I’m a bit of a tea addict. I drink it all day at work, all kinds. Prefer green but have white and herbal. I serve it to whomever would like some as well! Sadly, not as many tea drinkers out there as I’d like! I serve tea to my kiddos and tell them about the great-grandfather, a Lipton man who drank three pots a day! During the winter months I drink hot tea in the morning and then as an afternoon pick me up! Then in summer I really adore it iced especially iced green with mint! I drink tea to relax or when I have a sore throat. As a Southerner, any time is a good time for tea. We drink tea all the time, often experimenting with different teas or mixtures of tea. Our favorite is a black tea with a hint of fruit, such as a berry medley. A popsicle made with a zinger-type tea is also delicious! We love tea in my home. We drink it cold and hot. With summer coming up, we’re looking forward to some tea popsicles. My family loves tea! We constantly have a jug in the refrigerator for drinking during the day, and I drink tea at night when it’s time to settle in for the evening. Whenever we have company we offer tea as one of the drinks they can have. A cup of hot tea has been my afternoon pick-me-up for a long time. Recently my husband gave up his morning sup of coffee and has replaced it with hot tea…I’m sure he would love to have a new flavor option! we drink a lot of tea, and have a pot of mint~chamomile on the counter at almost any given moment. as we head into summer, we’ll have a pitcher of it in the fridge as well. I’m not sure whether Canadians may enter, but just in case: I serve hot tea whenever I feel like it, but usually in the morning and evening. I’ll make a pot of it if somebody else is around, but often I’ll make it just for myself in a big mug. I like iced tea for hot summer days, too. I serve it hot or cold…depending on the season. I serve tea at night when I am relaxing after the kids are in bed. I also serve tea at the first signs of a cold. I dont have lemon tea readily available- what could I use instead? Lemon juice? I would substitute whatever kind of tea you have and a little lemon zest.